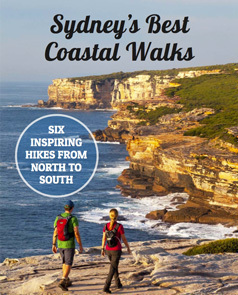 Easy-to-read and simple to follow, this Coogee to Bondi Walk Map PDF has everything you need to explore the most stunning part of the Bondi to Bronte walk, and Bondi to Coogee coastal walk. Easy-to-read and simple to follow, this Bondi to Coogee Walk Map PDF has everything you need to explore the scenic Bondi to Bronte walk and beyond. Featuring a comprehensive legend, including tour stop points, toilets and amazing photo opportunities. 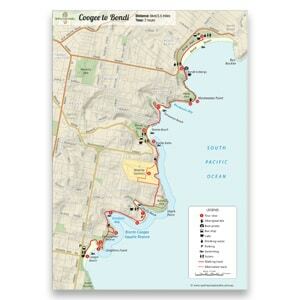 Get immediate access with a printable A4 sized map PDF. Or simply download to your favourite smartphone or tablet for full-colour map beauty on the go. 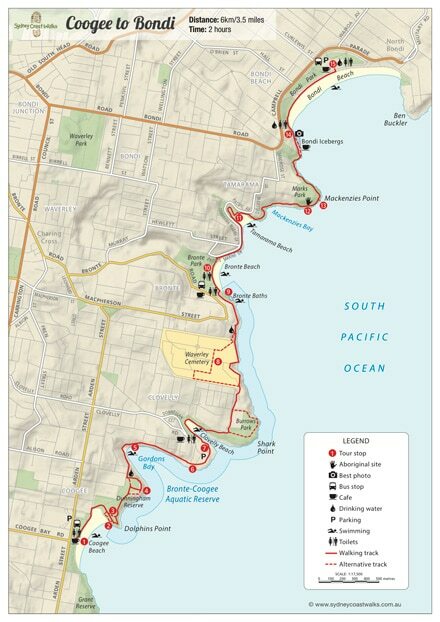 This is your number one tool for the Bondi to Coogee coastal walk, a map that has it all! Read more about the Bondi to Coogee Walk, including detailed directions for getting to the start and public transport options. Stop 6: Gordons Bay Underwater Nature Trail this page is on its way! Stop 7: Clovelly this page is on its way! Stop 8: Waverley Cemetery this page is on its way! Stop 9: Bronte Beach this page is on its way! Stop 10: Bronte SLSC this page is on its way! Stop 11: Dobroyd Head this page is on its way! Stop 12: Tamarama this page is on its way! Stop 13: Aboriginal engraving site this page is on its way! Stop 14: Mackenzies Point this page is on its way! Stop 15: Monument to Black Sunday this page is on its way! Stop 16: Bondi Beach this page is on its way!